Door County Living, celebrating the culture and lifestyle of the Door Peninsula, is published five times annually by Peninsula Publishing & Distribution, Inc. 8142 Hwy 57, Baileys Harbor, WI 54202. 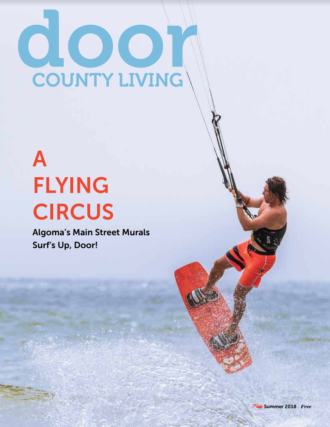 To order a subscription please mail a check of $25 to Door County Living, 8142 Hwy 57, Baileys Harbor, WI 54202. If you would like to advertise please visit doorcountymarketing.com. © 2018 Peninsula Publishing & Distribution, Inc. All rights reserved. Door County Living is a Peninsula Publishing & Distribution, Inc. company. Locally owned. Locally minded. Door County’s Aviation History: Coming! Coming! A Flying Circus! Door to Nature: Do Insects Bug you?